Do you see this gorgeousness!? SO much colour! SO many things to nibble! SO many excuses to use Sriracha! I’ll try to control myself, but I make no promises. Many of you may know this, but for those who don’t “sushi” actually refers to the rice. “Sashimi” is the word for fish. So when I say vegan sushi, it’s totally legit. You know what else is totally legit? This Vegan Sushi Bowl! Gah! Few things make me happier than large bowls of food, especially when soy sauce is involved. I swear, I could just eat a bowl of rice and soy sauce for dinner and be totally content… in fact I have, many times. I love how simple and nutritious this dish is. Just what I need in this January blah weather to pump up the vitamins. 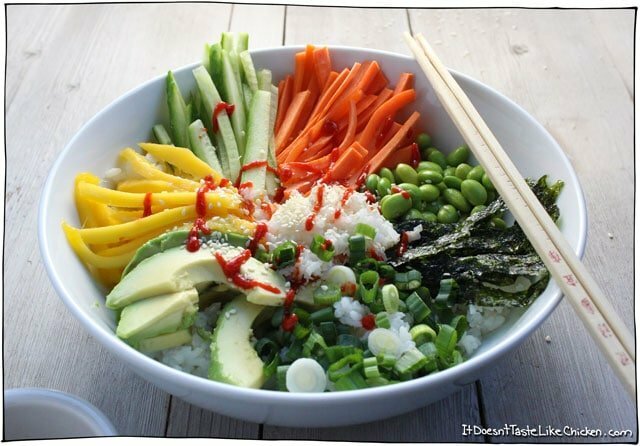 If you don’t have all the veggies listed, or if you think your sushi bowl would be the much better with say… red pepper and some bean sprouts, then you’re probably right! This bowl is totally customizable, so make it your way. Just stick to the sushi themed veggies and you are good to go. 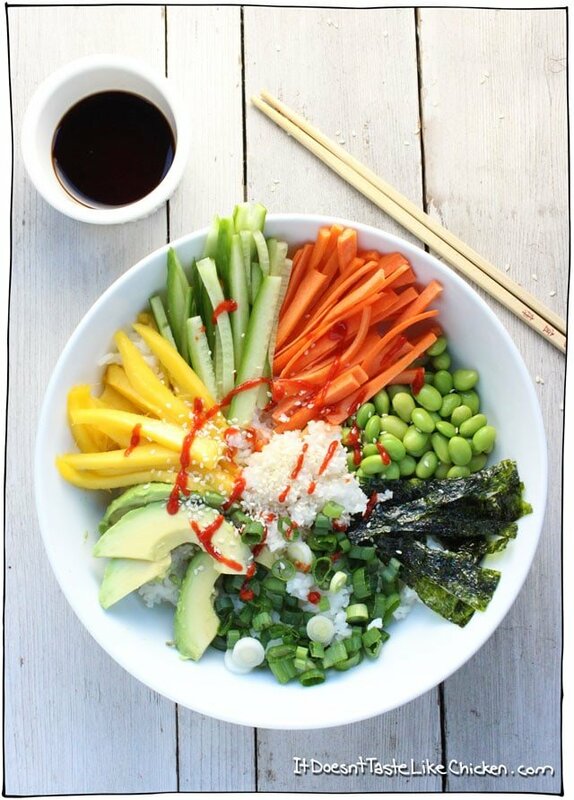 To make this vegan sushi bowl, start by preparing your sushi rice. In the meantime, just chop up all your veggies. Yep, lots of chopping, but it is so, so worth it. Then just put some rice in a bowl, layer all your veggies around, sprinkle with some sesame seeds, and serve with soy sauce and Sriracha. So simple, so delicious. Like a deconstructed sushi roll. So healthy and easy to make! 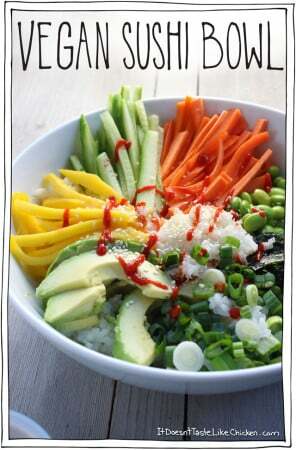 Just cook some sushi rice, thinly slice the veggies, mango, avocado and seaweed, sprinkle with sesame seeds and enjoy! Put the bowls together by putting a layer of rice in the bottom, then dividing the veggies amoung the bowls, displaying them as you like. Sprinkle with sesame seeds and serve with soy sauce and Sriracha. How do you prepare/use the seaweed sheets? Do they need to be boiled first? My seaweed sheets don’t look edible right out of the package. There are a lot of different kinds of seaweed. I’m talking about roasted seaweed snacks like this one on Amazon. They are intended to be eaten straight out of the package as a snack. Definitely gets rid of that sushi craving in a healthy way! Think it would also be great with some sweet potato. Picky husband loved it! Thanks for another great recipe. Is it me? 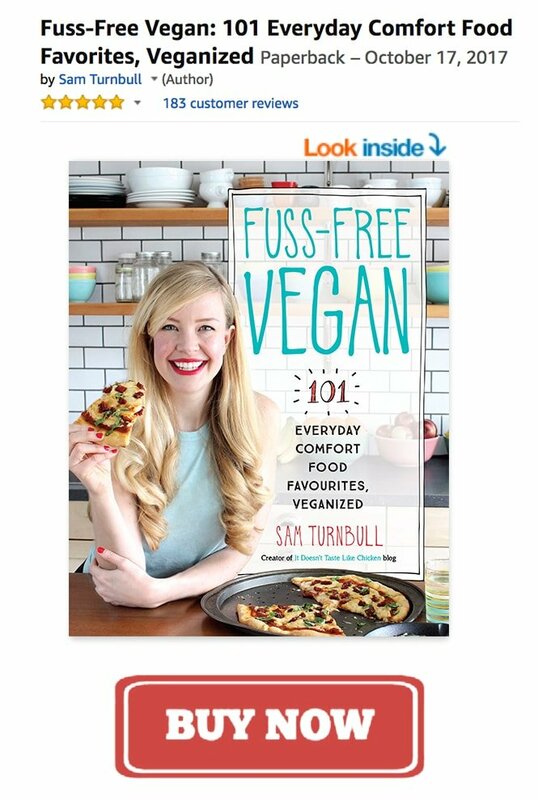 Or are there just not enough hours in a day/days in a week to eat all the different things you want to try when you’re new to being vegan? I’ve made so much food the last 3 weeks I need to get a lodger! (my cats are devastated by the way) This sushi bowl rocked my world, I want to eat it every night forever. Thank yoooooou!! I LOVE sushi, but this vegan sushi bowl tops anything I’ve eaten in any sushi restaurant ever! My favorite meals are always when I pack everything in a HUGE bowl and dig in!! It’s just so darn comforting 🙂 This looks incredible! Can’t wait to try it! Haha! I am totally with you! I have these two huge bowls (one is in the photo), most people would use for serving food, and I use it as my personal sized dinner. A trough of food is the way I roll! Haha. I like it! I have high sushi appetite this winter, and this lazy sushi bowl – it’s great idea! :) And I’ll try to do some sushi bowl for my russian blog! Of corse to mention you as my inspiration!:). Hi Jenny!!! So glad you decided to say hi. Oh my gosh Sam! This is so delicious! I posted mine on IG and Twitter. So fabulous! Mine didn’t look as pretty as yours but it sure tastes good! Haha! Yoyo. That’s so cute. Not a pig at all! (I did pretty much the same thing, shhhh don’t tell). This is definitely going on next week’s menu. Maybe with some sesame baked tofu for warmth and a little more substance (I’m a wuss about cold meals when it’s cold outside). Looks delicious! Really…I think is unnecessary to find at any costs a relations with the meat and fish cook! 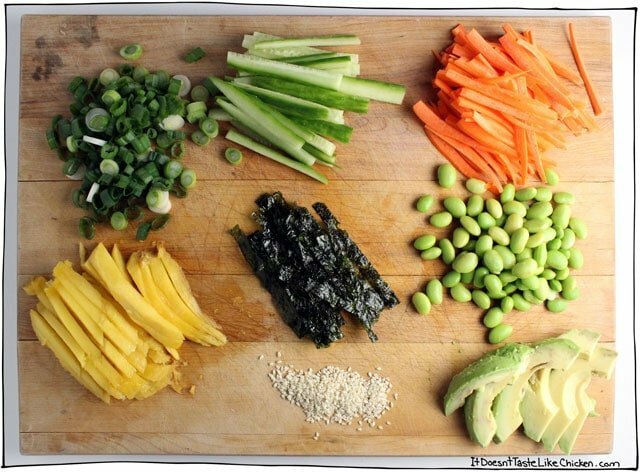 I love crudités, I wouldn’t eat a vegan sushi…noway! anyhow I’m sure a lot will like to call it vegan sushi. I would say in this case that “sushi” refers to the flavor combination as it mimics the flavors found in sushi, particularly the seasoning on the rice, the nori, and the siracha. None of those flavors are included in traditional crudités. Cooking it’s not only taste is also visual. We first see…then we decide if we want to taste. without the name still remain crudités…I’m sure it’s possible to make this dish also visually look like the vegan version of a fishy/meaty dish! So fun! I actually just learned the sushi/sashimi difference so was super stoked to see this post!!! Me too! In the past when the word sushi was mentioned my brain did a fast track to smells and tastes like fish = yuck. Now i know better! what a beautiful display of healthful, delicious food!